We are St. Louis Wildlife, Inc. a full-service wildlife removal company servicing the greater Saint Louis MO area. We resolve conflicts with unwanted opossums. When Can You Solve My Opossum Problem? We have three full-time technicians and a full time office person. Yes, we will answer your phone call any time of the day, any day of the week! We usually provide same-day or next day service, and we offer emergency service 24/7. We service a wide range. Common problems caused by opossum include: living under a shed or deck, eating pet food, or even living in an attic. 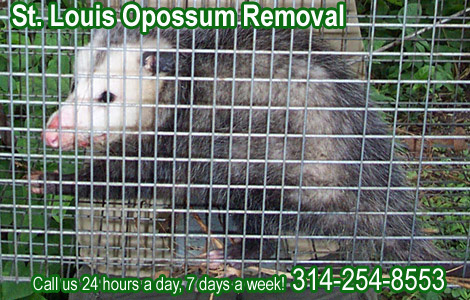 Our company specializes in wild animal control, including St. Louis opossum removal. We are not a pest control company, or an exterminator. We deal strictly with wild animals. We are also not the Saint Louis county animal control, and we do charge for our services. Although most people believe that the possum is a creature that should be exterminated as soon as possible, it is actually a very interesting animal. Despite the disease that it can bring with it, especially in its feces, and the fact that it is often home to fleas or ticks, the noise it makes in your home, and the pets they love to fight and interfere with, the possum is still an interesting animal nevertheless. The possum is believed to be dated as far back as the dinosaur age, which just proves that this creature is smart enough to evolve to live alongside humans. From the days it was once only nocturnal, it is now venturing out during the day more and more. You are likely to spot the feces before you spot the animal itself however, and you may also notice brown stained patches around the walls and ceilings of your home – this is the urine that the possum leaves everywhere. This urine actually attracts other possums. Usually a grey/brown/black/white color, there are variations of colorings, and if you want to be doubly sure that the animal you think you have in your yard is actually a possum, it is well worth taking a peek at the creature’s pictures online. It’s diet is one of the best points about the possum – it is so long and varied; it is no wonder that this creature has been evolving and adapting for so long. Mice and insects are a keen favorite, as is pet food, (cat or dog) sugary foods and fruits, and even the leftovers that you would throw in the garbage. Nothing is too bad for this possum to eat! Of course, you can’t mention the possum without mentioning the play dead factor, and although you will probably be terrified or amused by this action, there is no doubt that it is a stroke of genius! Playing dead means that the animal that has proved to be the threat believes it has won the fight, and will leave the possum, if only for a little while, giving it enough opportunity to get away. Read about What To Do If You Find A Lost Wild Animal.